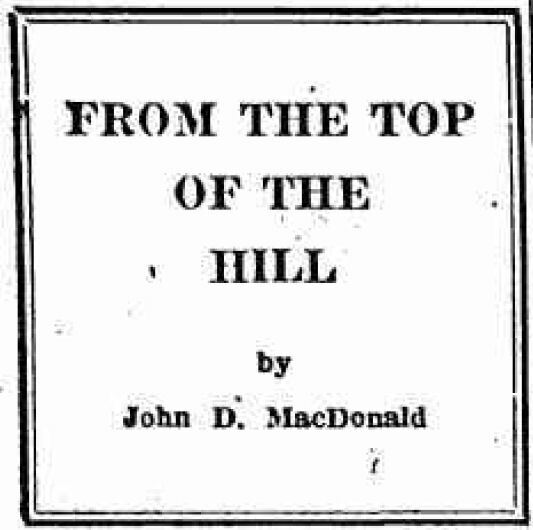 John D MacDonald's third column for the Clinton Courier, from the very early days of his career as a writer. This is pre-Florida for the MacDonalds, and here he seems every bit as involved in the governmental workings of his surroundings as he was to become as a Floridian. 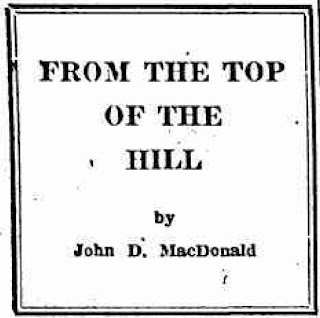 I've mentioned before that Clinton was the model for the town of Dalton in MacDonald's 1956-57 novel Death Trap, and in that novel the author uses Clinton's town square as a central point in Hugh MacReedy's investigation. He even retains the name of one of the streets leading into it. Incidentally, if you had taken JDM up on his two sports wagers offered at the end of the piece, you would have won the first and lost the second. Now that the headlines on the testimony of various Hollywood characters have faded away -- to reappear later, no doubt -- we must confess that the whole affair gave us an odd feeling of unreality. There were those famous faces -- R. Taylor, G. Cooper, R. Montgomery -- performing for the investigating committee. We are used to those people as two dimensional beings on a flat silver screen. We are accustomed to seeing little publicity releases on their marriages and their swimming pools. To have then plunked down in the middle of a discussion of ideologies seems a bit like reading an appreciation of Einstein by one Mickey Mouse. The next time we go a few steps up Fountain Street and buy ourselves a hunk of celluloid escape, we will gaze at those famous faces and ponder that the life of an actor or actress is indeed a hard one. Not only do you have the responsibility for getting rid of several thousand dollars a week, but you might at any time have to sit in front of a group of unsympathetic Congressmen and be led into a discussion of realities. Any touch of reality must be quite a jolt to our tinseled friends out there. The number of cars on the road is constantly climbing. On these wet evenings at dusk it is becoming more and more of a dangerous experiment to drive through town. The Williams Street-College Street corner is particularly fascinating. Not only is traffic coming in from four directions, but people are also angling for diagonal parking slots along the curb. Wouldn't one-way traffic around the square be a sound idea? Each of the six streets feeding into the square could become stop streets, including Utica Street. You wouldn't be able to turn left from Williams into College; you'd have to go all the way around. The blinker could be eliminated. According to the way people ease around the corner turning right into College Street, it doesn't do much good anyway. It might well be moved to another corner. Maybe where the kids cross. Or the corner of Bristol Road and College Street. Or maybe we just haven't been informed of some unapparent but good reason why there should be two-way traffic around the square. With elections over, we can talk about a few trends we have noticed. One is the change in county government. The Political Scientists have made clear during past years that the American City, financially speaking, is a dying organization. Cities have rigid boundaries and an assessed valuation which must bear the costs of running the cities. As total valuation decreases -- through increasing age of structures -- the dollar of assessment must bear a higher tax, thus penalizing new construction. The citizens continue to expect all city services. To avoid tax rates, the citizens buy or build outside the rigid city limits and still retain many of the commercial advantages of city life. The State of New York has been quietly going to work on this problem, This past year all welfare was taken away from Utica and Rome and centralized under Oneida County. The state refunds 80% of all welfare costs. Thus the city tax burden is lightened and County Government becomes more of an agency of state government. The boys who try to look into the future tell us that county and city government have overlapping functions in too many cases. They say that one day not too far in the future, all local governmental functions, including police and fire protection, will be consolidated in the hands of the county. Frankly, we would like to see this happen. We have the idea that the towns and villages elect to the Board of Supervisors men less likely to be rubber stamps than are the men elected to the Common Council of a fair sized city. We believe that county government is the logical place, the logical body of men, to accept responsibility for the government of all the citizens of the county, country and city alike. We feel that no agency of local government is likely to be entirely free of the unfortunate effects of machine politics. We do feel, however, that if and when county government becomes the sole surviving agency, citizen interest will be focused to an extent that will make breeding conditions of machine politics a bit more unfavorable than at present. Machine politics thrives in inverse ratio to citizen interest. Citizen interest can be measured by the degree of participation in such organizations as Community Councils, Bureaus of Municipal Research, Leagues of Women Voters, Taxpayers' Leagues -- and all other non-partisan city and county organizations. If such organizations were as healthy locally as they are in, say, Monroe County, we would have better county and city government. Having attended three colleges at one time or another, we can usually depend on at least one of them to come through with a pretty decent football team. This year we are claiming Pennsylvania as the alma mater. They are undefeated, but there seems to be a conspiracy among sports writers to ignore that fact. In national ratings Penn is listed lower than Columbia, which took a 34-14 whacking from the Penn men. Somebody is taking the joy out of life. We brag about Penn and get blank looks. To get even, we will make a prediction. Penn will defeat Army by -- at least one touchdown, and Cornell by at least three. Any takers?